Summary: God’s Law crushes people and drives them to despair. Yet without this preparatory work, the sweet Gospel would fall upon people unable to grasp their need for forgiveness. 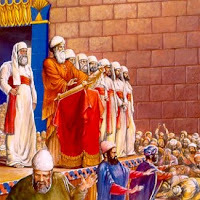 Nehemiah, Ezra, and others joined together to read and proclaim the full counsel of God — His wrath against sin and sinners, His love for fallen man, and His forgiveness for those who trust His promises. God doesn’t want His people to dwell on their guilt or wallow in self-pity and self-condemnation. He wants us to have the same joy in being His redeemed children as He does in claiming us and as Jesus did in saving us. His joy at our salvation gives us the strength to overcome our own doubts and sins and to carry forth faithfully. 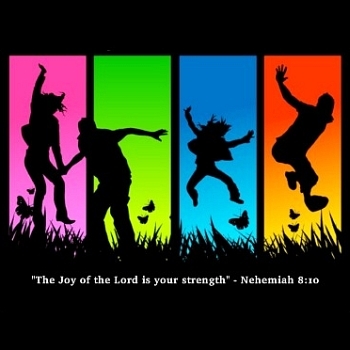 This joy becomes ours when we believe in Jesus and trust that, in Him, nothing can separate from God’s love. Text: And all the people gathered as one man into the square before the Water Gate. And they told Ezra the scribe to bring the Book of the Law of Moses that the Lord had commanded Israel. So Ezra the priest brought the Law before the assembly, both men and women and all who could understand what they heard, on the first day of the seventh month. And he read from it facing the square before the Water Gate from early morning until midday, in the presence of the men and the women and those who could understand. And the ears of all the people were attentive to the Book of the Law. And Ezra opened the book in the sight of all the people, for he was above all the people, and as he opened it all the people stood. And Ezra blessed the Lord, the great God, and all the people answered, “Amen, Amen,” lifting up their hands. And they bowed their heads and worshiped the Lord with their faces to the ground. 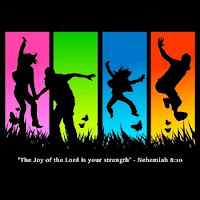 Audio: Click to hear the MP3 of The Joy of the Lord Is Your Strength, preached to the saints of God at Faith Lutheran Church, Knob Noster, Missouri.